Please refer to our stock # Y2-0508 when inquiring. 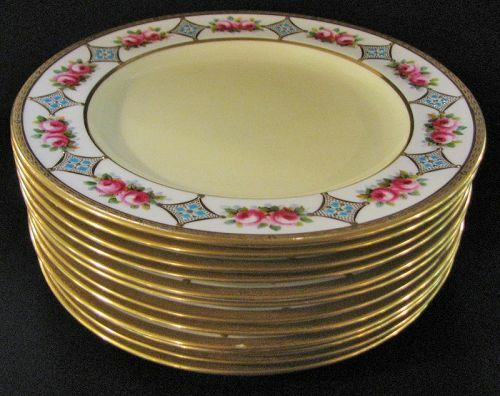 From the Regent Works, Longton, Staffordshire, we offer this set of 12 Royal Crown Chelsea plates. Each plate has a soft yellow center. The border is gold encrusted and features alternating designs of raised aqua blue and gold enamel squares and double pink roses. The plates are 9 3/4 inches in diameter. The mark is the red mark and indicates that the plates were made as part of the Regent works, Longton, Staffordshire. The band across the middle reads, "Morris," for Thomas Morris, original founder of the works in 1892. The Crown Chelsea mark was used somewhat later so these plates, most likely, date between 1912-1926. Two plates have repairs - one to the rim, the other an early staple repair. There is one very minor tiny spot of gold loss on one rim. The bulk of the plates are absolutely perfect.